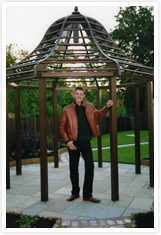 Lansing Landscapes was established in 1998 when I, Gus Lansing, was awarded my National Diploma from Hadlow College. Lansing Landscapes is a small but incredibly hard working company based mainly in West Wickham and the surrounding areas in Kent. The majority of our work comes via recommendation or from passersby who stop to admire our work and ask for a business card. People who know me know my work when they see it - the design always carries within it my trademark of quality with style and simplicity. Lansing Landscapes is a well liked and trusted business that’s rapidly growing from strength to strength. This is due to our unique landscaping style and the fact we use varied materials in our designs. I’m proud that we deliver such high quality landscaping, on time, and to budget. I’m driven by the challenge of garden design, and enjoy the need to adapt to constantly changing materials, styles and tastes in the world of landscaping. My motivation is simple – I am lucky to be paid to do a job that’s been my passion since I was a little boy. The goal I have is to design a garden that I can show at Chelsea Flower Show. To win gold would be my greatest achievement. Copyright 2009 © Lansing Landscapes. All rights reserved.